Islay region – 59.35%ABV – cask strength – 700ml bottle – $?? | £?? | €?? – I could not find this one available anywhere. It was bottled in 2002 and limited to 12,000 bottles. My guess is that it was in the £250 range (which is more like $450 to my fellow yanks out there). I consider myself very fortunate to have met so many interesting and kind people in the wide world of twitter. I could go on naming names but I wont. I will say, with regards to this tasting, I need to thank one of my twitter friends: Keith from Whisky Emporium. 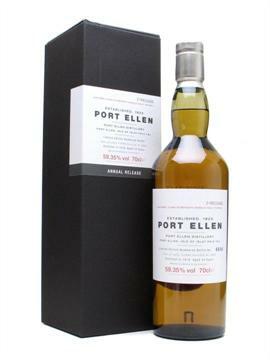 He and I did a sample trade and my sample was this lovely and rare Port Ellen expression. Keith, thank you. If you’ve not visited Whisky Emporium yet, please do. There are lots of great tasting notes, glass suggestions for different malts, whisky & food pairings, whisky & chocolate pairings, etc… He’s got a very robust & unique site. With regards to Port Ellen, it’s really one of the few Islay distilleries that I basically know nothing about. Rather than focus on the distillery, I will focus more on the whisky itself. If you’d like some information on the Distillery, here is a link from The Whisky Exchange with more info. I will say that this stuff was so unique (especially given the style of the whisky itself, as you will read below, and it being an Islay malt) that I do plan on finding out more about Port Ellen and the history of expressions. And, if my funds take a huge turn for the better, I may even buy some of this stuff. I can tell you that Port Ellen whiskies are rare and uber-expensive!! Initial whiff – Wow, this noses more like a Cambeltown – Grassy/flowery peat, fruity, definite hints of sea breeze. Maybe a little bit of the smell of an electrical charge, metallic (not Metallica, though this stuff does rock) in a way. On the mouth – Nearly undrinkable without water. Some like it hot and some sweat when the heat is on, I’m sweating here… I need a little water. Ahhh, much better. Back to the fruits (think citrus – oranges & kumquats), grassy again, malty, waxy mouth feel, lots of smoked seafood here (yes, this coming from a vegetarian (I used to eat fish)), tar (sans feathers) and very delicate peat. It is 24 years old after all. It seems the peat has lost much of it’s fight or, better yet, it’s compromised with the other elements. Very complex and quite yummy! Finish – Long, the fruits stay but now the peat is a wee bit stronger. In sum – This stuff is worth it’s weight in gold. It’s an Islay in Campbeltown’s clothing. Of all the regions, I do love Campbeltown the most. Extremely complex, lots of salt, fishy peat & yummy citrus. Because of the lighter style (read: more delicate peat with the addition of salt & fruits) I would suggest this one in the spring or summer time when you just want to take it easy or feel refreshed. Good luck finding some though! !